How long have you been injecting Botox in Modesto? -Natrella Inspira implants. Yes, we offer them here at Surgical Artistry! 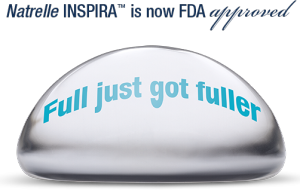 -“More gel in the shell!” Inspira implants have a higher fill volume of silicone gel, resulting in a rounder, fuller breast. -Inspira is available in 5 new profiles from low to extra full. -Natrelle has been added to BD. -Natrelle implants earn you 500 BD points. -You can spend 1,000 BD points toward your surgery. -Natrelle Gel Rewards Program can earn Botox or Latisse for the patient and a friend when the pt chooses Natrelle implants. These rewards are for naive patients only. (New to Botox or Latisse). It was a pleasure meeting Bryan! Why did I pay double price for OBAGI? This is a good question. Thank you for asking and giving me an opportunity to answer. First, apologies for any confusion and it is always my goal to provide best value. I try to subscribe to the idea that price is what you pay, but value is what you get. Second, I don’t personally have any experience ordering Obagi from any websites. Thus I can only comment on our own Obagi products on our physical shelves. Third, if for some reason the pricing makes no sense from us. Just return it. No problem. Hopefully we’ll all be happy – that’s always my main goal is to have happy patients. 10% off from us on Obagi. We offer 10% off all the time and sometimes at special events we offer 20% or 25% off. I can definitely see that the internet might offer 20% off or even 30% off? But for my medical office to carry Obagi, I feel that it isn’t worth my effort to have more than 10% off all the time for Obagi. Otherwise, I would just encourage my patients to buy Obagi elsewhere. But I carry Obagi, so I can be responsible for the outcomes and ensure good results. Free OBAGI follow ups with your MD or our office staff. I’m hoping what accounts for a better value at our physical location (Surgical Artistry, Modesto, CA) is that we will take the time to explain the products and adjust the usage of the products. Patients follow up with me (Dr. Calvin Lee) or with Dr. Wu. Most of these follow ups have no added charges. I think visits to the doctors office has some value – especially if we can make continued adjustments to the usage. Easy Returns / exchanges. I also have a hassle free return policy on the patients who purchased Obagi after talking to me about it (Dr. Calvin Lee). I would say that if you feel the internet is a good purchase, then just return the products to us. My goal of having Obagi in the office is to help our patients look their best with Botox and Juvederm. Botox and Juvederm (and now Kybella) are my primary passions in the office. OBAGI is an adjunct. REAL OBAGI. We know that our Obagi products are genuine. Doctor’s Presciption for Obagi is included when purchasing from me (Dr. Lee). We also know that we are following the rules regarding prescription products. Clear and Blender which are two of the products in the normal kit and some kits have SunFader. These three products require a prescription from a doctor. I think there are some foreign countries where a prescription isn’t needed for these products – I am not sure. Travel Size Nuderm Kit? Sometimes people want the Travel sized Nuderm Obagi Kit. But we don’t currently carry that. I don’t have the pricing on that kit, but I believe that it is in the $200’s. Sometimes the internet pricing is confusing and they might be touting the travel size rather than the full size? First, I am concerned about the prescription legality issues. Second, I am concerned about the genuine vs. counterfeit versions. Especially if the prices are lower than my own wholesale pricing directly from Obagi. We have had several experiences with patients who have brought in counterfeit Obagi and patients who have suffered damages from counterfeit “Obagi” products. Third, I am concerned about return policy. And Fourth, I am concerned about the ability to follow up with a skin care professional and make continued adjustments if needed – especially if the products require prescription. Those are just my own hurdles if I were thinking about purchasing skin care items (ie. Obagi) over the internet. I have to admit, that I have done for other skin care lines for myself (I have bad skin and am guilty of experimenting) and I will admit that I’ve learned (for myself) to regret it. I also purchased a washer and dryer over the internet – that was a BIG mistake for myself. I will also agree that sometimes our prices “seem” high – this goes for Plastic Surgery, Botox, Veins, etc. But with a higher price, I hope to offer higher skill (such as better advice), follow up, better safety, less pain (in this case, less pain in the return process), better attitude from us, better communication and in the end, better results. That’s my dream practice is to offer these things at the highest level. I’ve built this practice of ours on highest quality with best value, not on lowest price, and I hope it’s worth it. Thank you for reading about the Surgical Artistry version of the Obagi Nu-derm Kit.